If I had my way I would have a cooking utensil for each type of meal. But, I don’t have my way and neither do I have the space, so I use my tatin dish for all sorts of meals. This may not last long. I used to use my tagine for tatin’s but eventually Dave convinced me to get the tatin dish. Last month when I was away, Dave got frustrated with the frying pans scratching each other in the cupboard. He put up a rail for the frying pans and now I have a blank space in my cupboard waiting for …. well, there are two items on my wish list. One is a crepe pan and the other a dish that I can use from stove top to oven to table for fish, or for these great sticky chicken wings. These look sticky and scrumptious! What a great combination of flavors; sure to please me and the man!! Hi Tandy, Your chicken wings sound so good with the asian marinade. Sticky and delicious! The chicken wings are looking delicious, Tandy! Any excuse to buy new kitchen stuff is good enough for me! Mmmm… I’m licking this Asian sticky flair!! I’d give anything for extra room to store a few more things!! How exciting to have a bit of open space to fill with something exciting for the kitchen. A crepe pan only takes up a little space so I reckon you should add another item if you buy the crepe pan. Im with Celia – great that Dave support’s your ‘kitchen’! 🙂 Probably because he also spends some time in it! My Hubs just looks me, and asks, where will I put it (cupboards a bit cluttered as it is!). 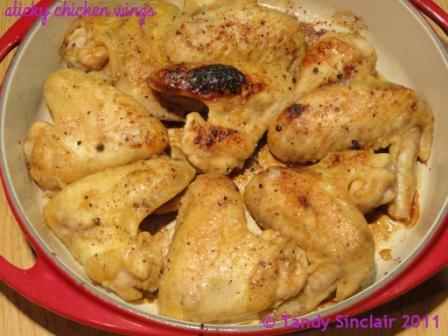 The chicken wings looks YUMMO and easy peasy! You are right about the great looking chicken wings,,,not to mention the roll call of savory ingredients…just for the record… I DO have cooking, AND Eating utensils for every type of meal that looks like that …called FINGERS… Man, now I’m really hungry. Love them served with potato wedges, thanks 😉 Friday greets to Dave. Friday greets back! Molly has lost her Cindy smell, come back!!!!!!!!!!!!!!!!! I think he might kill me if I use up the space too quickly!